NEW Lower price! Was $29.99, now only $27.99! The Authentic shirt is the shirt that started it all. This is the closet thing you can find to the shirt Arnold was wearing the day he won the 1975 Mr. Olympia contest. The shirt is 100% cotton. The letters have a velvet look and feel, just like a shirt straight out of the 70's! 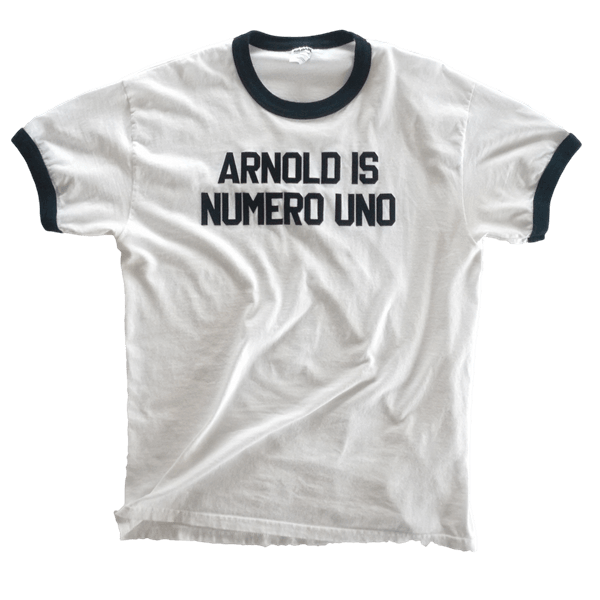 So you want the same exact shirt Arnold was wearing after Mr. Olympia, but you want your name instead? This is it. This is the shirt you want. It's 100% cotton, pre-shrunk, and comes with velvet lettering, just like in the movie. If the Authentic shirt isn't for you, the Replica is the next best choice. We recreated the Authentic shirt, but with a less-expensive printing technology to help keep the price down. You'll look great in this vintage 70's attire! 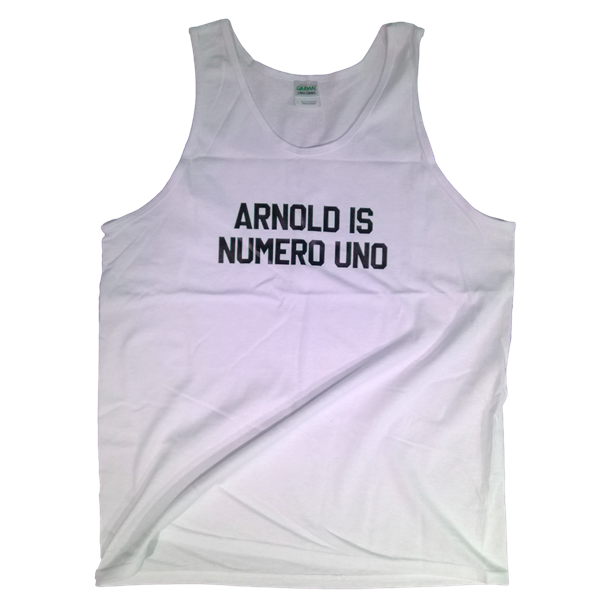 This is the tank top version of the ARNOLD IS NUMERO UNO t-shirt. You can stick with the classic 'Arnold,' or you can customize with your own name! Show off those guns and enjoy the summer sun while showing off your love of the Governator. 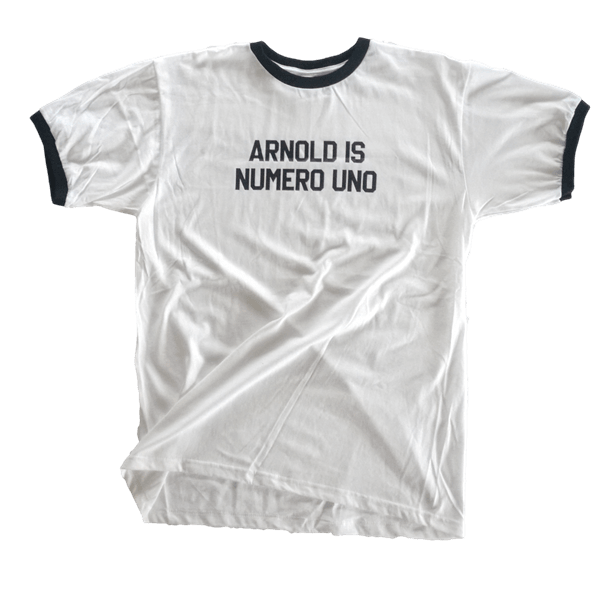 This is just like the classic ARNOLD IS NUMERO UNO shirt, but you can customize it with any name! Remind everyone who's the boss by customizing with your own name. It can also be the perfect gift for the avid bodybuilder in your life. You can get it customized with your friend's name, your mom's name, or even your dog's name! 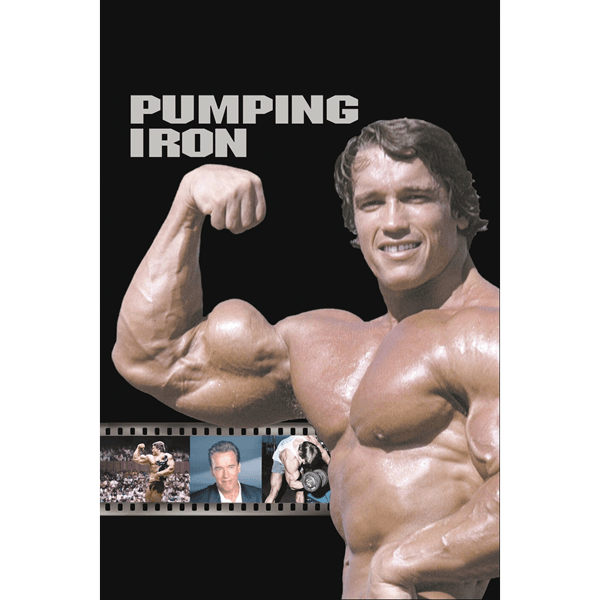 The Pumping Iron DVD is the classic that got this whole thing started. From Gold's Gym in Venice Beach California to the showdown in Pretoria, amateur and professional bodybuilders prepare for the 1975 Mr. Olympia and Mr. Universe contests in this part-scripted, part-documentary film. Five-time champion Arnold Schwarzenegger defends his Mr. Olympia title against Serge Nubret and the shy young deaf Lou Ferrigno. This is the closet thing you can find shy of the shirt that was on Ronnie's back the day of The Unbelievable filming. The shirt is made on top of the line 50/50 shirts. The letters are exactly the same size and font as the original shirt as seen on Ronnie Coleman. Sure to intimidate, motivate, and send out the message that you're in the gym to do work. This hooded sweatshirt is perfect for those colder months, or for the gym that's just too cheap to turn on the heat. Support the Austrian Oak while you still stay warm. 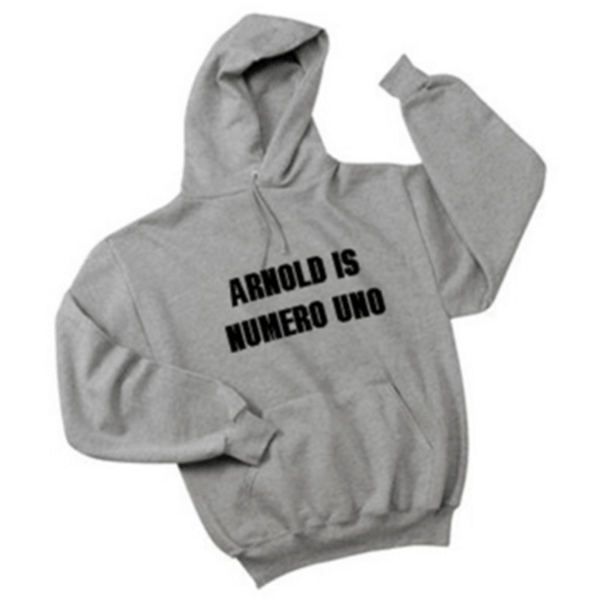 You can get the standard 'Arnold' or you can customize it with any name! Remind everyone who's the boss by customizing with your own name. It's the perfect gift for the avid bodybuilder in your life. You can get it customized with your friend's name, your mom's name, or even your dog's name!